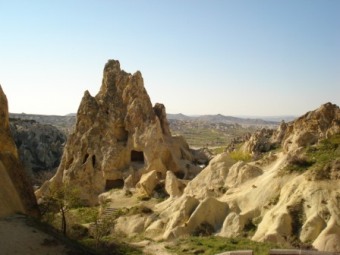 Even if one is not religious, it is one of the nicest places to spend Easter: Cappadocia, Turkey, the home of the fairy chimneys -- these huge lunar pillars, cones, and spires rising in a crisp blue-white sky -- with the churches of the earliest Christian monks carved in their caves. The strange landscape (made of compressed volcanic ash) goes on for miles, and I chose the village of Goreme as my base, as it is known for its "open air museum. The oldest chapel of this museum -- a UNESCO World Heritage Site -- is dedicated to St. Basil, the man who started the whole tradition of monasteries. 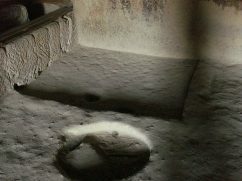 Stepping over the open graves of the former monks (shaped like oblong bodies), one enters a rounded enclosure with bright frescos of what are called "Maltese crosses" (painted in red ochre) as well as frescos of Jesus Christ and George spearing a tail-less dragon. The monks used to pray in these caves and then go to the villages to teach the Christians in their homes (when not persecuted by the Romans). 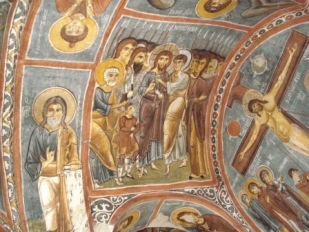 The most spectacular cave churches at the site -- such as the "Dark" Chapel and St. Barbara's Chapel -- are covered in vivid frescos depicting early Jesus at the last supper, Judah giving him a kiss or -- a popular image -- Lazarus rising from the dead. My favorite: the church dedicated to St. Katherine, whom I learned is considered the "intellectual" saint. It was "Anna," the richest most powerful woman in Byzantine who funded this chapel. "One strong woman gives homage to another," my learned guide Mustafa explained, as he smiled under the arch. The refectory where the monks ate was also of interest: in the stone is carved a vat for the monks to stamp grapes -- for the wine to run out a small hole into a puddle. 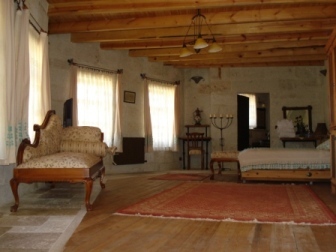 Even today, Cappadocia wine -- deeply fruited and lightly oaked -- is an exquisite treat. Eager to see the sun set over the valley -- with only ten minutes to go before the day had gone -- I hitched a ride with a young man on a motorbike, who told me -- as we clumped up the hills -- that he liked to keep his moped unrepaired as the clip-clopping sound reminded him of the sound the horses made when his grandfather took him around on a cart. He also told me that as a child, he was told that fairies hid in the odd pillars, and he had been afraid. Now he knew it was a myth, he said. After the sun set into darkness, the young man scooted me over to the town hammam, where I stripped in a room of stone while a woman (in a rather bad mood) scrubbed me in a frenzy of suds. Washed down, I also found myself washed of my Masaai warrior necklace -- the black-and-white mask that kept me company on my travels -- and the entire staff of the hammam ransacked the dressing rooms, the pool, and the buckets of towels: to no avail. How sad, I thought, rather happily, and a few moments later, walking down the quiet evening street, in search of a restaurant, I came upon a gentle man standing with his tea, to whom I nodded, and he invited me to have a tea with him. "I am a tailor," he said modestly, bowing. "Would you like to see my shop?" He proudly showed me into a small room with a sewing machine and traditional embroidered Turkish clothing hanging on the walls -- and his wife briskly making something with a huge pair of sheers at a back table. "What is that?" I said, attracted to the white lace in the woman's hands. "It is a necklace," the woman said -- and she came forward to hook it around my neck. Her two daughters eagerly came forward. "A necklace!" I said -- touching my bare neck. "Yes," she said. 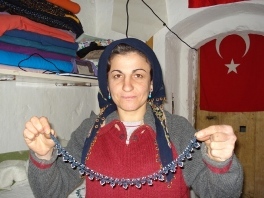 She was a maker of necklaces. Each took three days to make. The husband poured me a cup of tea, while the woman and her daughters hooked and unhooked necklace after necklace around my neck -- the man inspired to take pictures -- and even a video -- of each intricate lace design on my skin, and the girls exclaiming in particular over one that was a turquoise blue. "You know, I lost my necklace!" I said, thinking of Lazarus rising from the dead. "And this is yours," the woman said, as we listened to the music of Asik Veysel, chanting about love and life. When we parted, she gave me a kiss on both cheeks and a strong hug at the door, she in her veil, me in my blue.